We often seek to describe what we are making in terms of what already exists, like the "Uber for massage" or the "Apple of razors" in an attempt to be relatable and easily understood. The downside of this is that we give up free-range innovation as the expectations for what we are building then become set by the analogy. Scott advises us not to succumb to society's gravitational force toward what is common and familiar because it can result in your fresh insights being pulled back to the mean of normalcy, thereby killing the uniqueness of the innovation you initially contemplated. What's so interesting about The Messy Middle is that Scott fills the book with apparent contradictions, with one essay arguing for a specific best practice and then the next arguing the exact opposite. By doing so, Scott is sharing the real-world balance and trade-offs inherent in any tactic. This essay served as that exact foil to the above. In it, he suggests sometimes in our attempt to disrupt an industry, our instinct is to be different. But often the best way to capture share of an existing industry is actually to be familiar. He describes how the team behind the June smart oven originally designed a wildly different-looking product that re-imagined what an oven even looked like. But they ultimately realized that if they wanted it to be considered as an alternative to an oven, they were better served by a product that actually looked like an oven. Since they were already trying to disrupt cooking, going with a more familiar form ultimately aided their adoption. To reconcile this with the above, Scott gives us the following rule of thumb: the only time you should force new behaviors is when they enable a unique and important value in your product. We spend so much of our time building engagement drivers into products, features and experiences intended to drive customer engagement of some kind, based on our understanding of customer needs. But simply marketing our products via engagement drivers misses a key human insight: that customers don't always get most excited about the features they are most likely to use. Instead, the features that excite people most are often the novel features, even if they aren't necessarily practical. Scott calls these the interest drivers. He shares how HBO GO initially promoted it's offering with the launch of Game of Thrones by introducing a detailed map of the fictional geography into it's app as a way to encourage people to download the app on their iPad. Even though it ultimately wasn't a heavily used feature, it's novelty drove awareness and trial of the iPad app. It's important then to realize when you are building engagement drivers vs interest drivers and to hold each feature to the appropriate measures for what it is ultimately designed to drive. In this essay Scott details the leading psychological theory on curiosity, known as the information-gap theory, describing how curiosity proceeds in two steps: 1) a situation reveals a painful gap in our knowledge (say a BuzzFeed headline), and then we feel an urge to fill that gap and ease that pain (and then we click the link). This behavior is so pervasive and is equal to other primal desires like hunger. Scott encourages us to take advantage of this when marketing our products. Instead of simply providing a tell-all about your product, the best marketing taps into the natural human tendency to want to learn and understand something that is not fully revealed. Unanswered questions drive intrigue, even if you weren't necessarily interested in the answer in the first place. Apple, with it's carefully orchestrated product launches and reveals, is the king of this, but all of us can take advantage of what Scott calls the "magic" of engagement. While Scott shares lots of lessons throughout the book on how best to take advantage of data, in this essay he warns us that some of the best decisions you make may in fact run counter to what the data suggests and are instead driven by intuition. He shares a great case study at Square: a few years back, Square pioneered finger-based signatures in their cash register experience. Ultimately when VISA and Mastercard decided to no longer require signatures for transactions below $25, the obvious thing to do would have been to remove the signature experience from those transactions to significantly speed up the transaction process. But Square didn't actually do that, because they realized that people found the signature experience somewhat fun and it also was a key branding component for Square and often the only way that customers were introduced to the brand. Even to this day they allow merchants to turn off signatures for transactions below $25, but it's on by default. A great example of how a core product decision wasn't driven by what the data clearly suggested, but ultimately was a win for Square. I hope this gives you a taste of some of the insights Scott shares throughout the book. 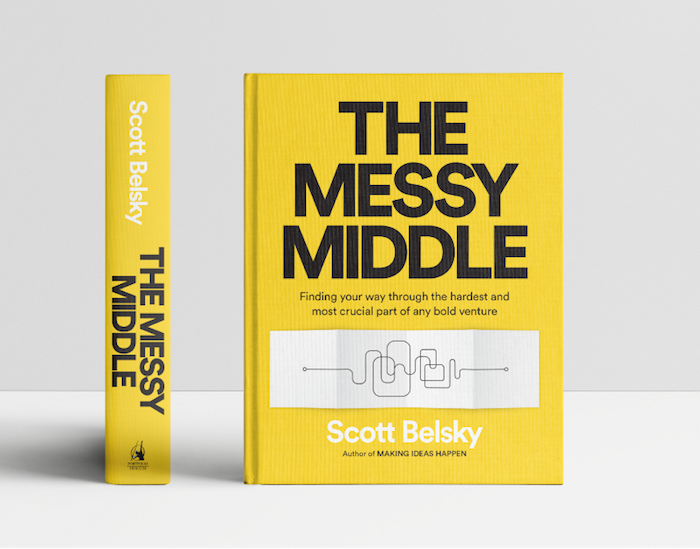 It's chock-full of so many more, so would encourage you to dig in yourself: The Messy Middle by Scott Belsky.